Testosterone Therapy is big business, with drug companies spending millions on marketing "Low-T" as the cause of many of the physical and emotional problems otherwise healthy men experience as they get older. These companies encourage doctors to prescribe testosterone gels and creams for men who haven't been actually diagnosed with a testosterone deficiency. Recent studies have shown the use of these testosterone products for "Low-T" come with increased risks of cardiovascular risks, risks that patients and their doctors were not informed of before usage. Two recent studies have found that heart attack risks more than doubled in men over 65 after using low-T products for just 90 days. The heart attack risk rate tripled for older men. If you or a loved one were prescribed testostone therapy and suffered side effects, you may be eligible for financial compensation. Claims are being filed on behalf of clients already who were affected by these testosterone products. There is a limited time to file a claim, so do not delay. Fill out this no-obligation case review form to have your details reviewed to see if you have a claim. Are you a male who has taken low testosterone treatments? Which testosterone treatment did you use? Which of the following injuries occurred? Please select one of the following injuries to continue. Do you currently have an attorney representing you on this case? Please provide details about this Case. I understand that submitting my details for a free legal review of my case does not create an Attorney-Client relationship. This website may be considered Attorney Advertising in some jurisdictions. In such jurisdictions, prior results do not guarantee a similar outcome. This website is not affiliated in any way with the following: Androgel ® is a registered trademark of AbbVie Inc. Androderm® is a registered trademark of Actavis. Axiron® is a registered trademark of Lilly USA, LLC. Bio-T-Gel® is a registered trademark of BioSante Pharmaceuticals, Inc. Delatestryl® is a registered trademark of Endo Pharmaceuticals Solutions Inc. Depo-Testosterone® is a registered trademark of Zibo Pan Xin Chemicals Co., Ltd. Fortesta® is a registered trademark of Endo Pharmaceuticals. Striant® is a registered trademark of Columbia Laboratories. Testim® is a registered trademark of Auxilium Pharmaceuticals, Inc. Testopel® is a registered trademark of Auxilium Pharmaceuticals, Inc. 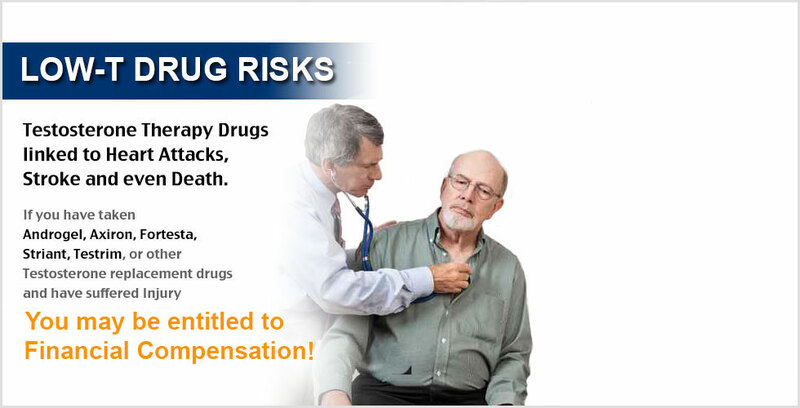 Consult your doctor or physician before starting or stopping any medications. This site does not provide medical or legal advice, and services are not available in all states.